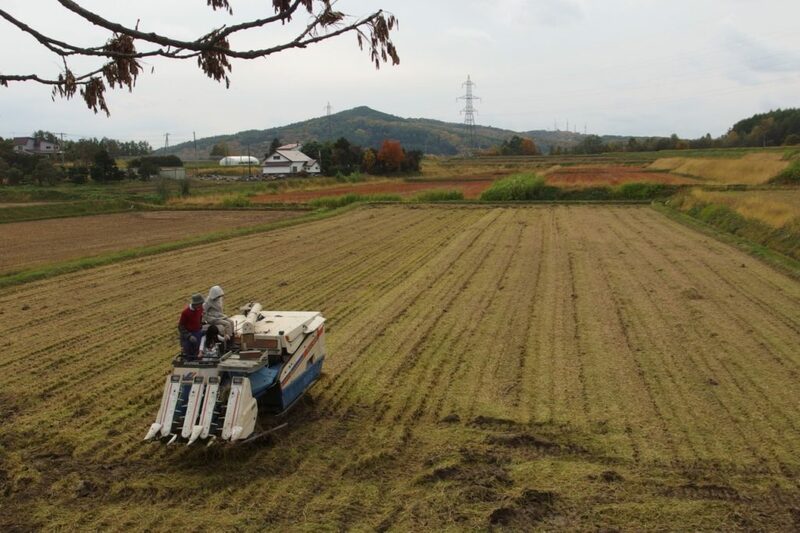 Last Sunday I did harvest work of my rice field at last. It was a calm and warｍ, very nice day for the harvest. Son’s and daughter’s family came for help, but I used the big harvest machine this year, so there was not a lot of work by hand. 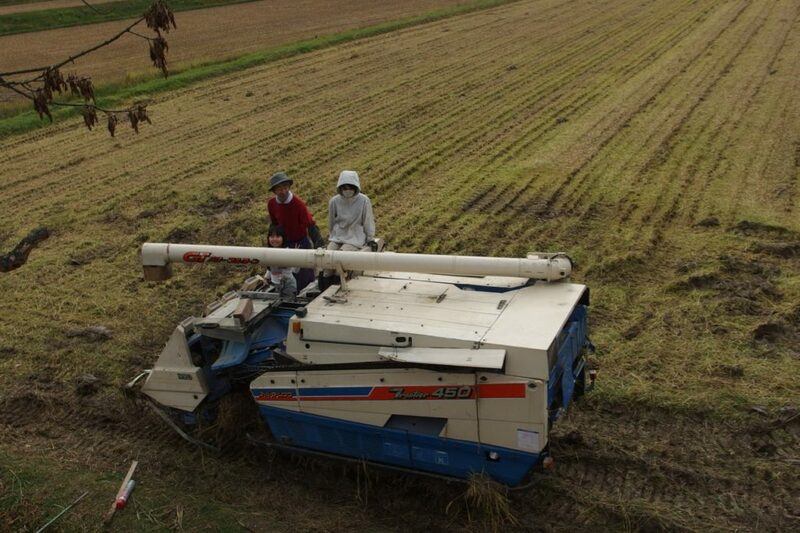 These photos show the end moment of harvesting work, ( in the beginning I was very nervous about using harvest machine so I forgot to take photos ) grandson and granddaughter on the machine, it looks very happy and joyful scene, but it was not. 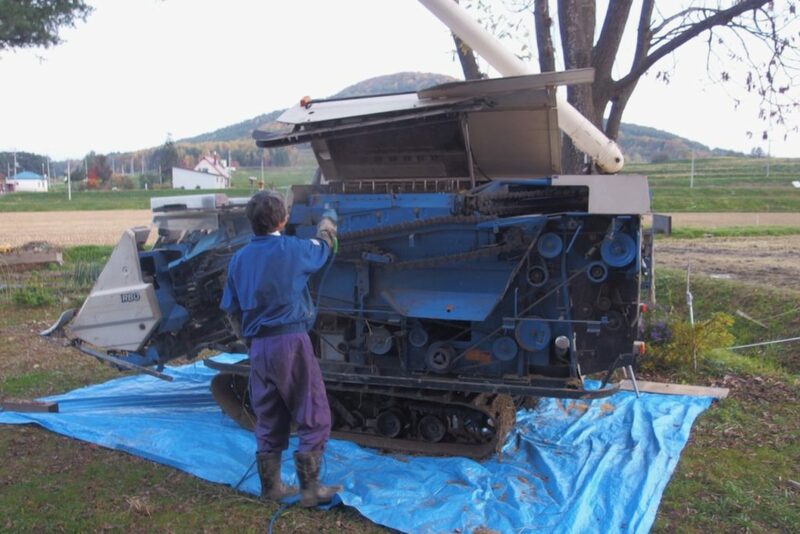 I used this old and huge harvesting machine last year and she( ? ) worked very well. Therefore I was thinking I can do more better than the last year…. but it was not. Maybe the reason was I didn’t understand the mechanism, it was too difficult for me to operate. 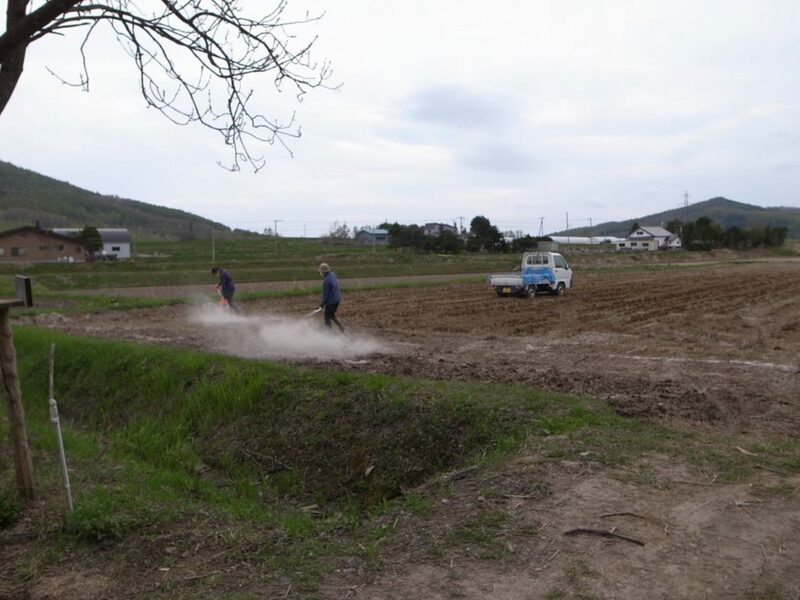 I dug the earth several times and I had to take out the mud from the cutting blade. I was so disappointed . 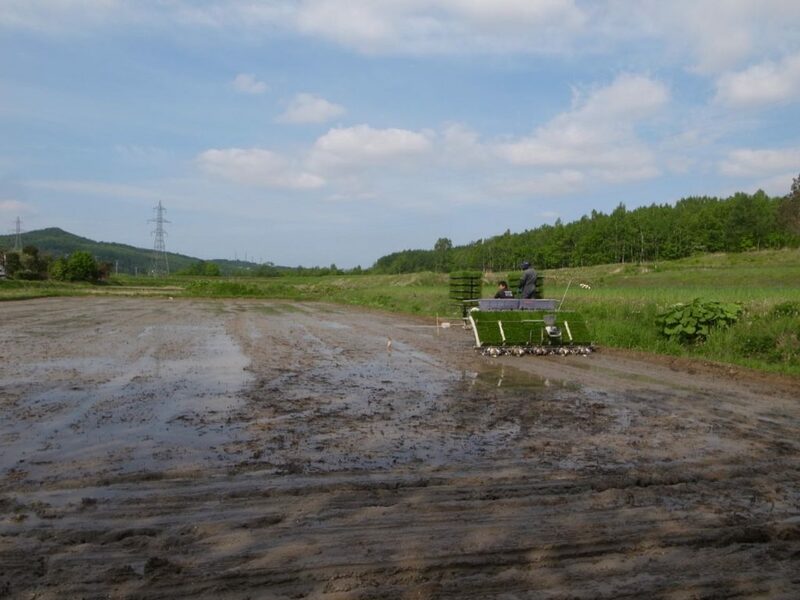 We had a lot of rain this Autumn and the ground was very wet, the machine could move because she wears wide caterpillar but it became very muddy at the end. 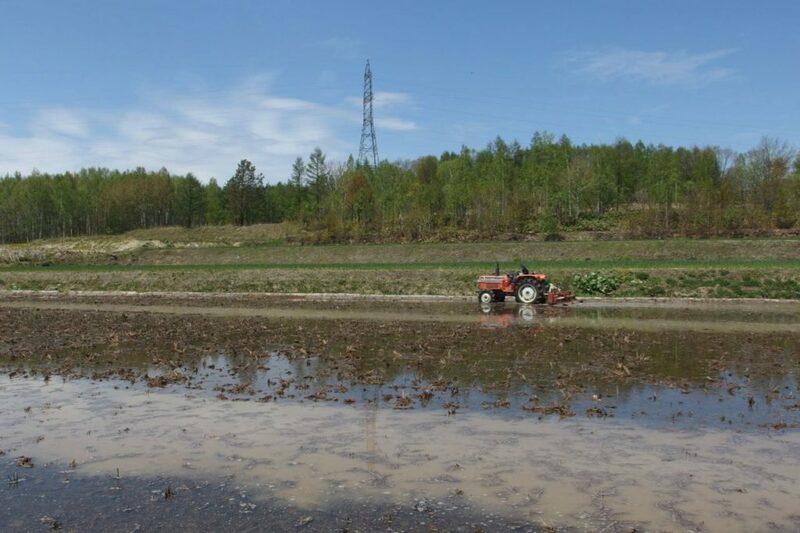 I have to clean up that, it takes 6 hours ( more than harvest work time ) it was hard…. 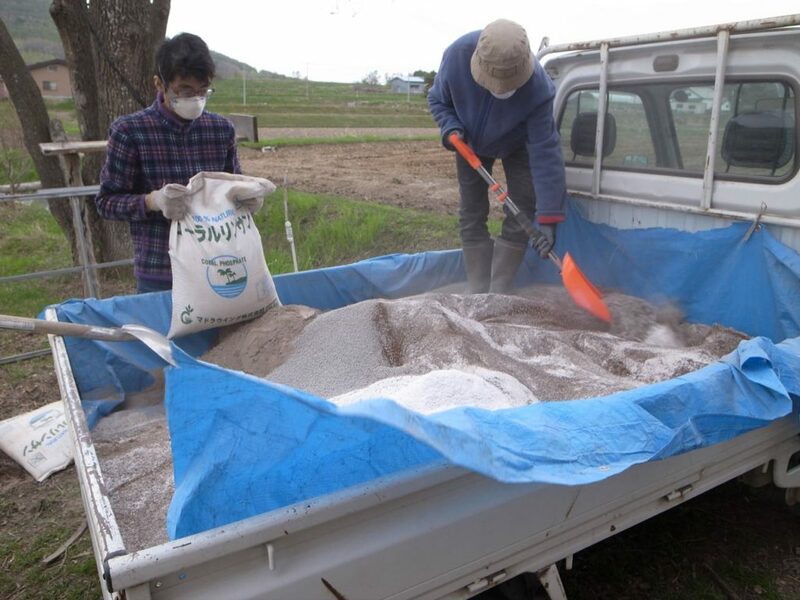 I carried the rice seeds to the harvest center of JA ( Japan Agricultural Cooperation ) and asked to remove the husks from rice. 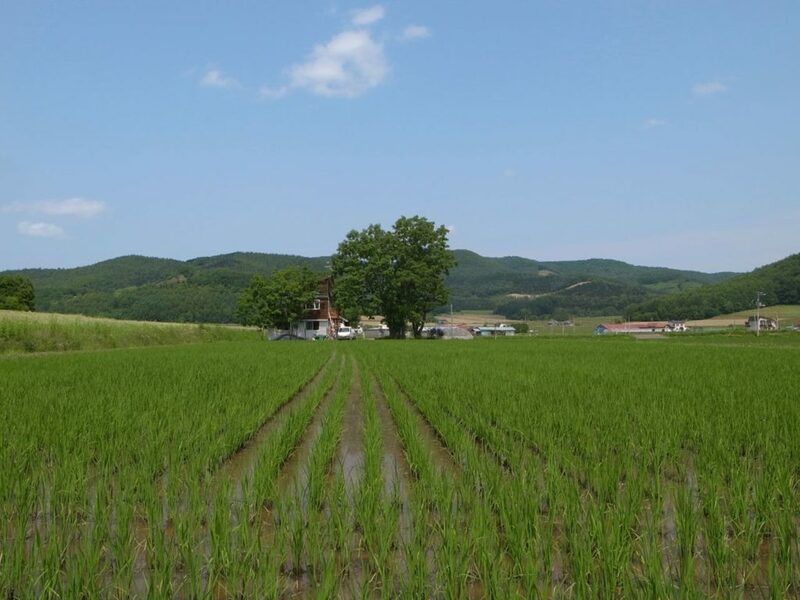 Anyway, my rice cultivating project 2017 was ended. Now I am waiting the rice coming back…. 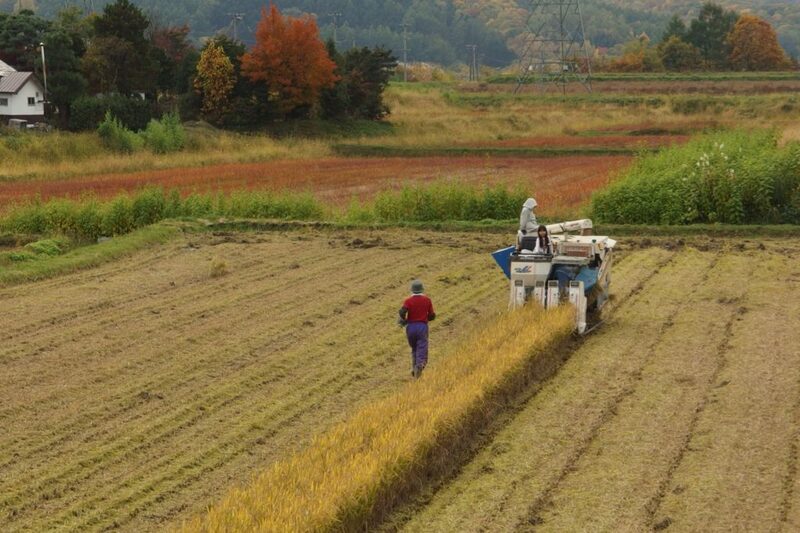 Normally I feel very happy after harvest, but somehow I don’t have the happy and joyful feeling this year. One week past after harvest. 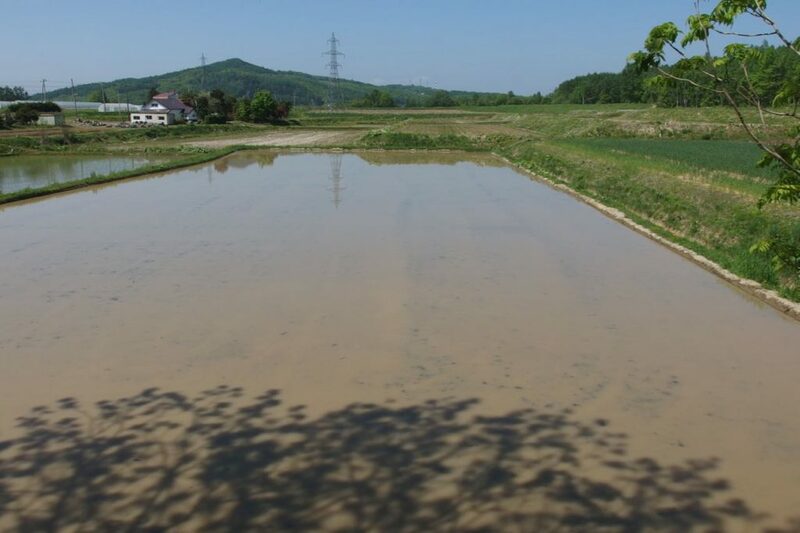 I look the empty rice field and still thinking how should I do next year. 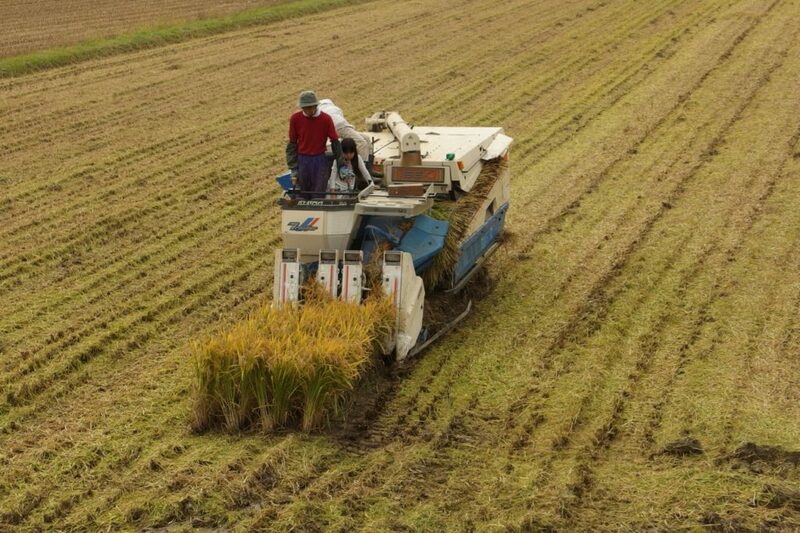 Yesterday neighbor farmer harvested his rice field with the machine. 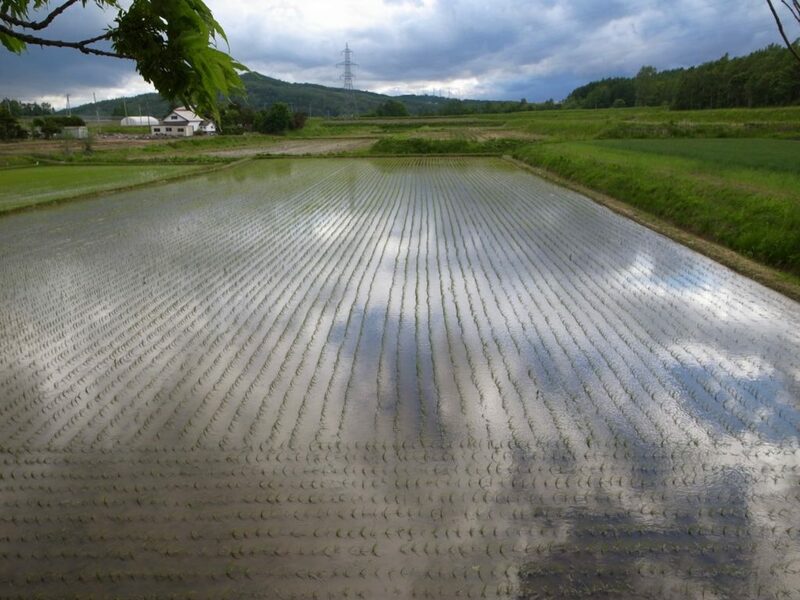 But my ricefield is still a little bit green, I have to wait to harvest in a couple of weeks. The leaves of the ash trees beside the workshop turning yellow and began to fall. Autumn is deepening day by day. 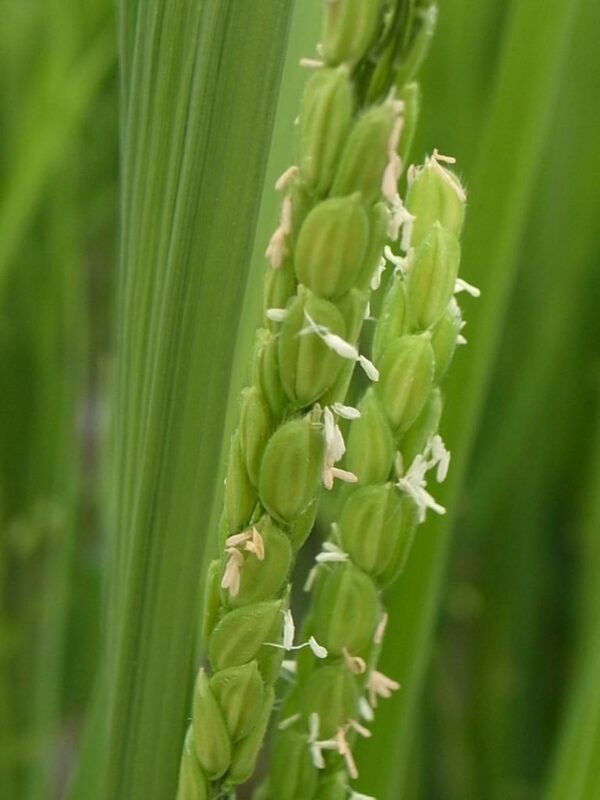 The rice flowers finished to blossom and the seeds begin to grow gradually. But a lot of weeds came to appear. I have to take out of those. 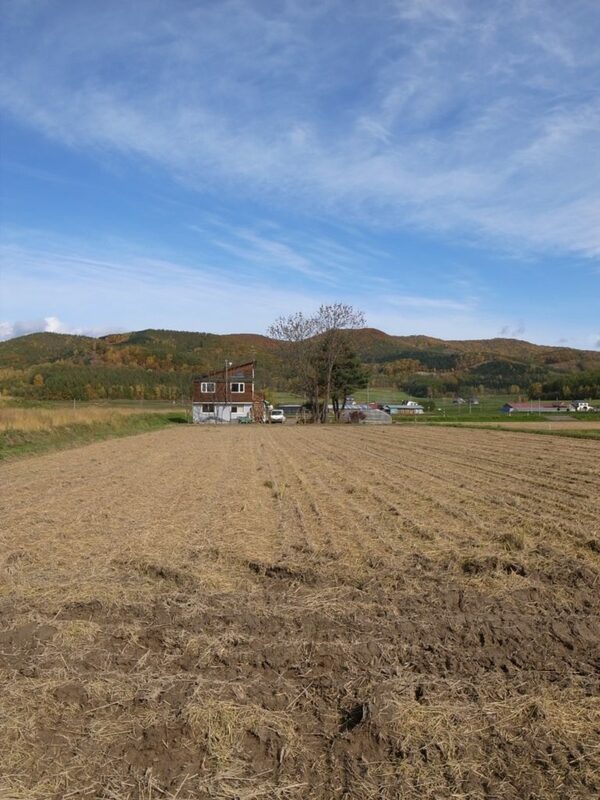 The blue sky has Autumn feeling. 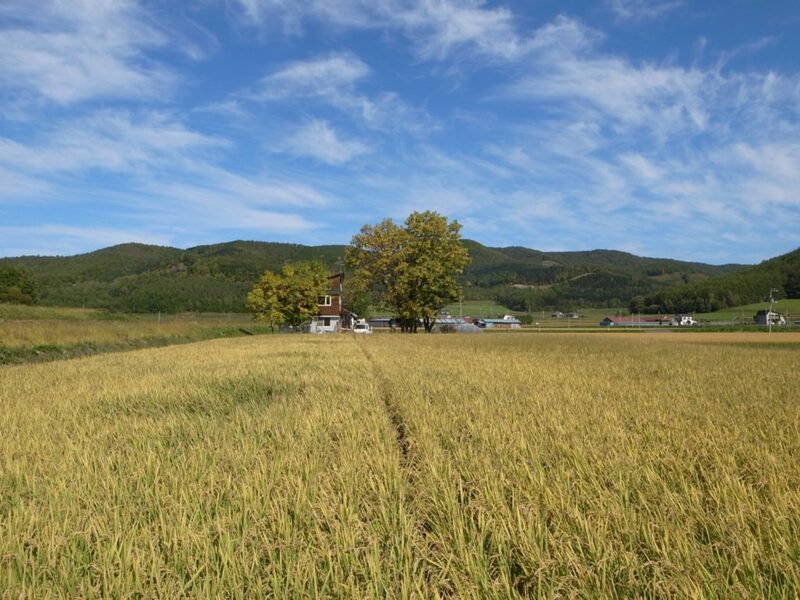 I believe it will be more beautiful ” blue sky and golden rice field “. Harvest season coming close steadily. Today I found the ears starting to appear. Tiny little flowers are blooming, it’s very lovely !! Within one week almost all ears will come out. The harvest season coming close. Two weeks passed from the pictures before. 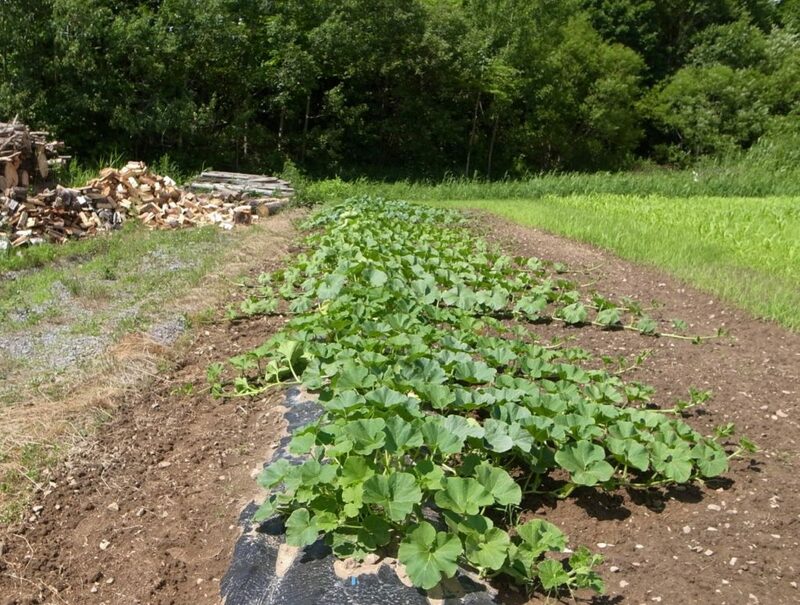 The rice and pumpkins are growing.The weeding work in night ended because the rice became big. 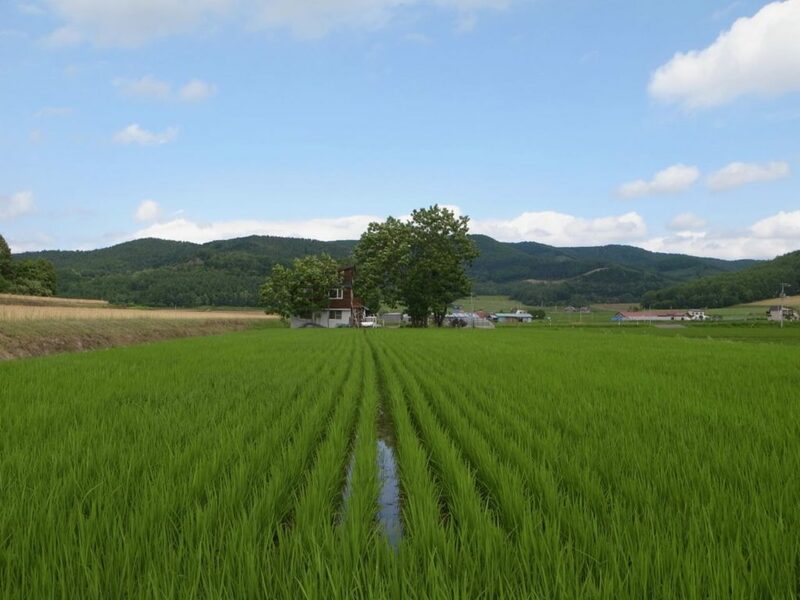 I am just watching outside the rice field. Last night when I was weeding as usual with a head lamp, I suddenly wanted to know how it looks and took the movie. 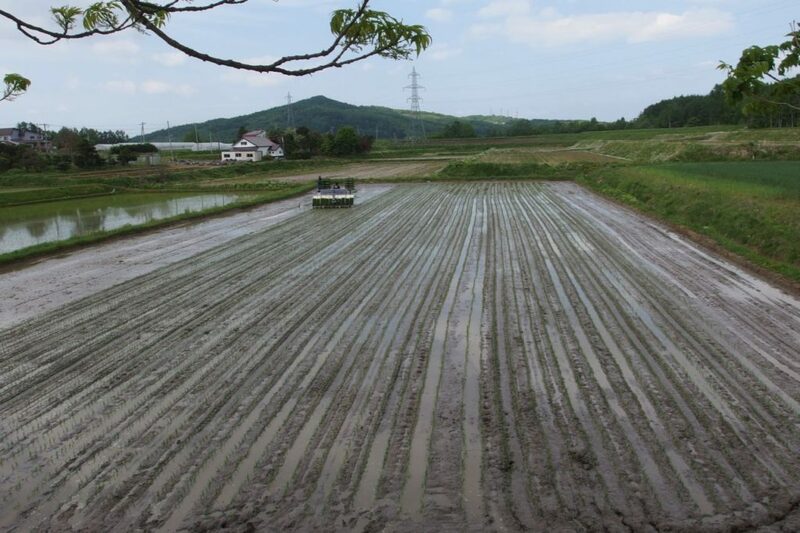 It was like this … My weeding work in the dark is almost ending this year because rice is grown up. It was little bit hard work but very fun. Yesterday night when I was weeding, found a light of a firefly. I tried to take a movie, but I knew my camera doesn’t have enough ability… sorry. 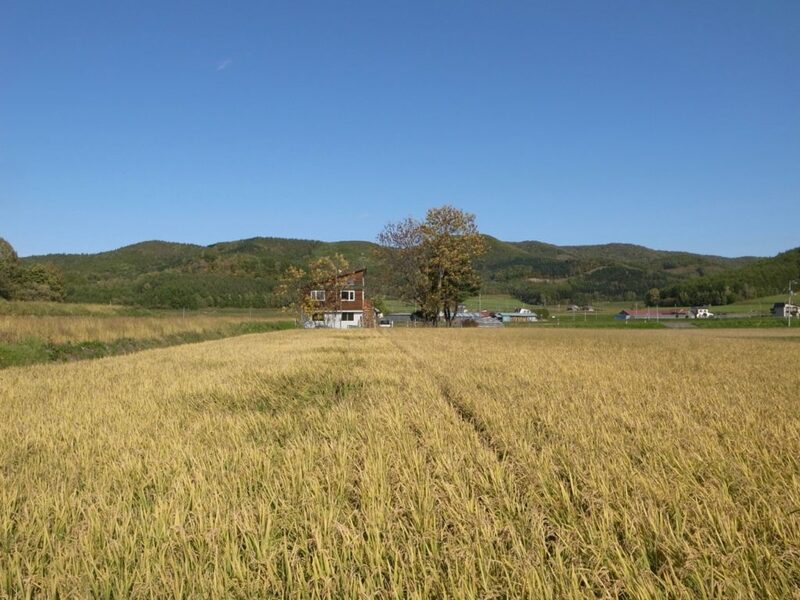 I dream lots of firefly flying on the rice field someday in the future. But I know it is not so easy thing. Yesterday was a very hot day, so I started weeding after sunset using classical weeding tools. 35 days passed after planting. Today the temperature is nearly 30 degrees, very hot. But the rice like kind of hot day. They look very fine. 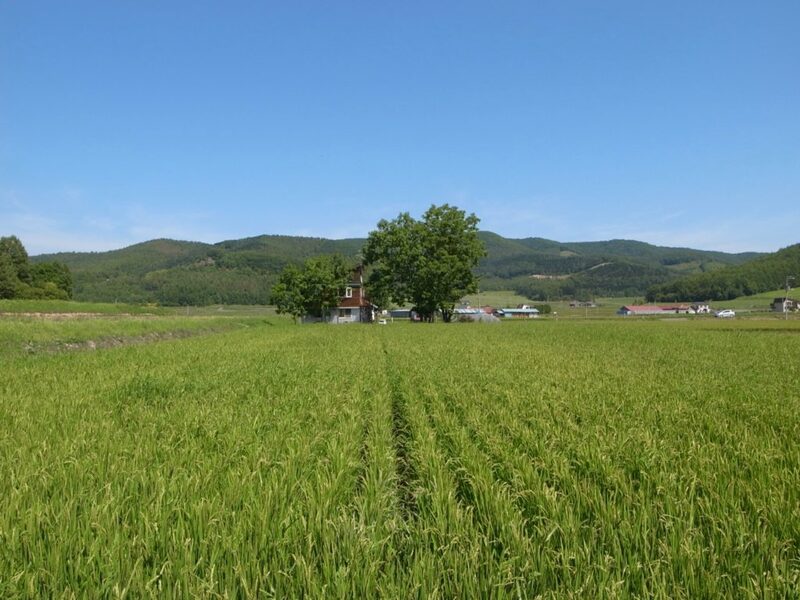 Blue sky and green rice field … I love this scenery. 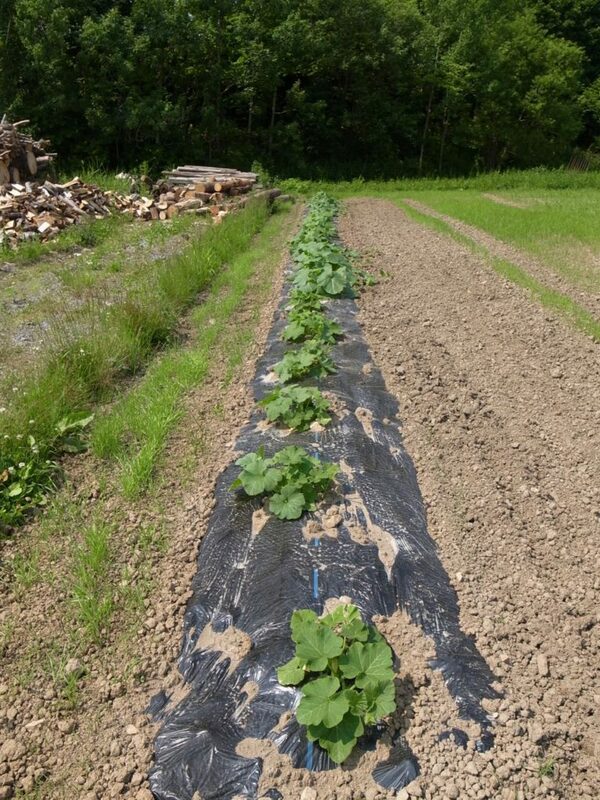 We also planted pumpkins. This hot weather is too hot for them but they are growing gradually too. It’s already two weeks past of June. Time is flying very fast. 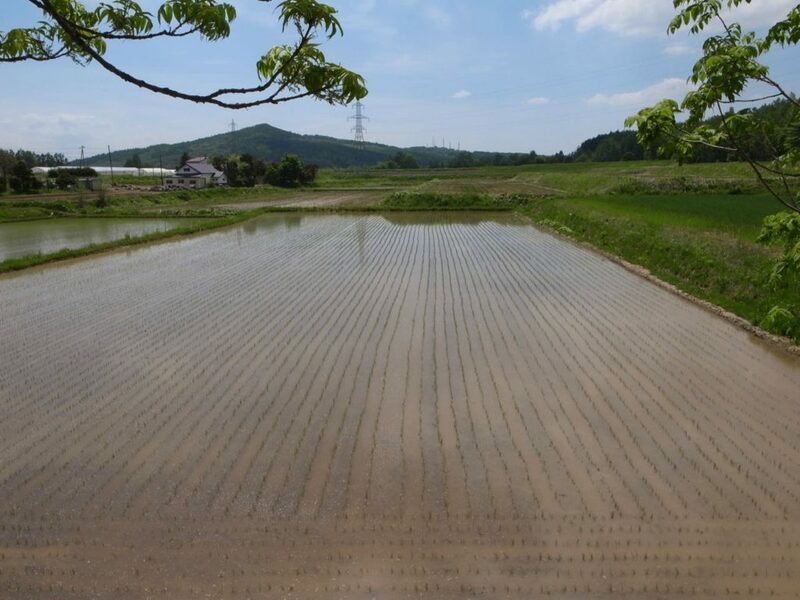 Last month I started rice cultivating of this year. 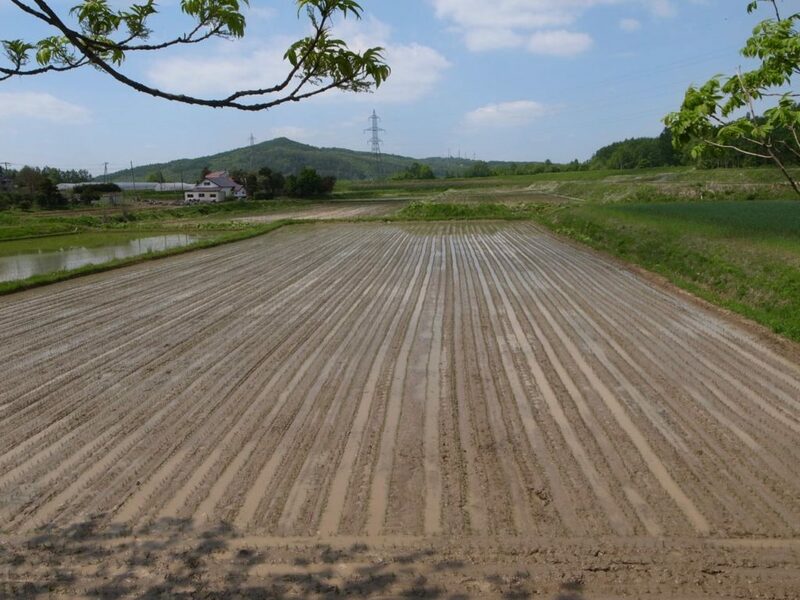 We had a lot of snow in this area and rice field wouldn’t dry until the end of April. So May is a busy month for farmers. 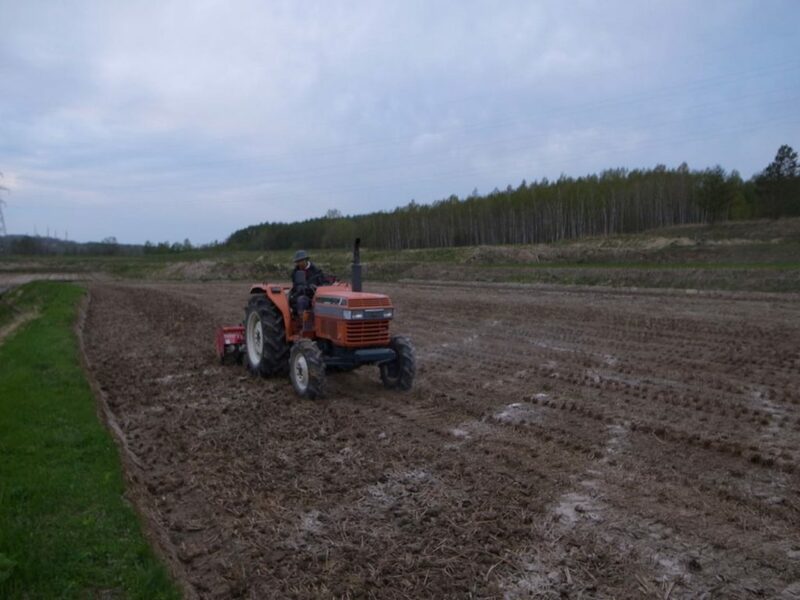 After some of the tractor work, I finished planting end of May. This year I had a little trouble and couldn’t use my planting machine, so I asked neighborhood farmer for the plant. His machine was very big, it took just only one and half hour. 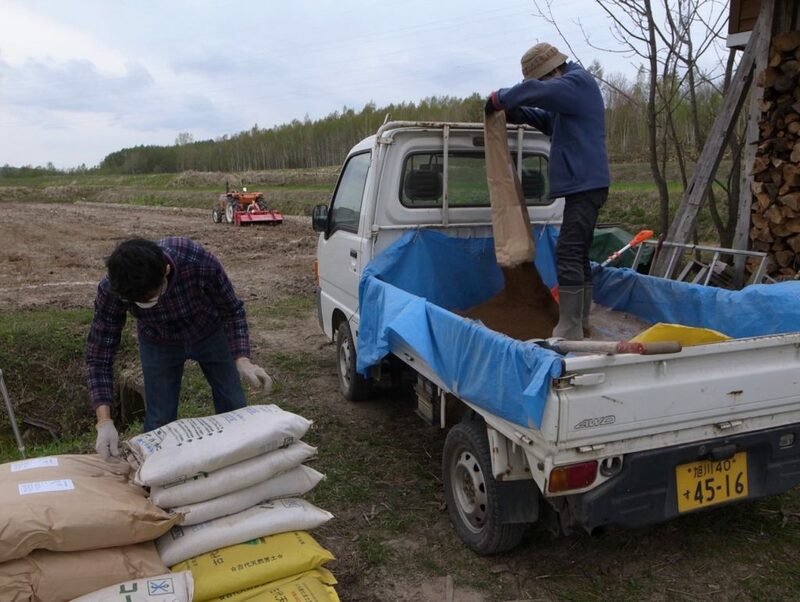 In the old time we planted rice seedling by hand, if we plant my rice filled by hand, it will take 10 people /8 hours. 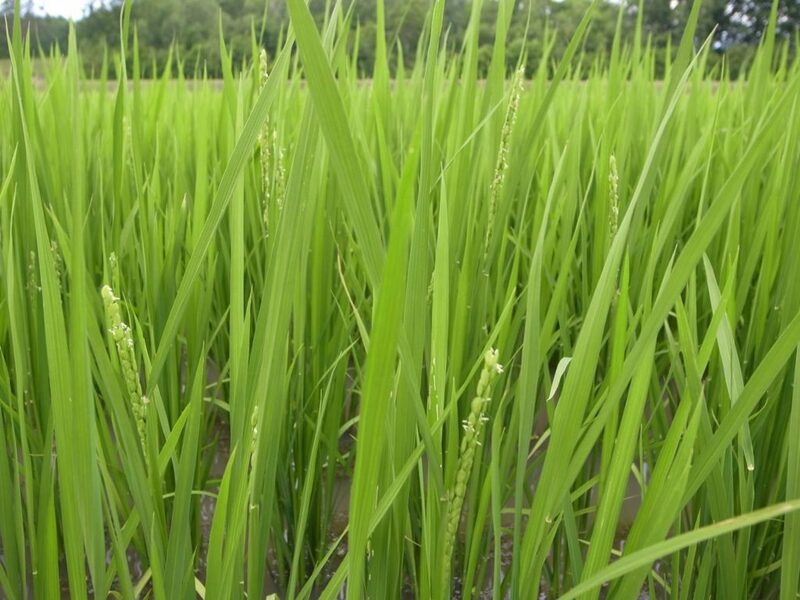 Two weeks passed, rice seedling grow gradually and also other plants coming up from the ground. 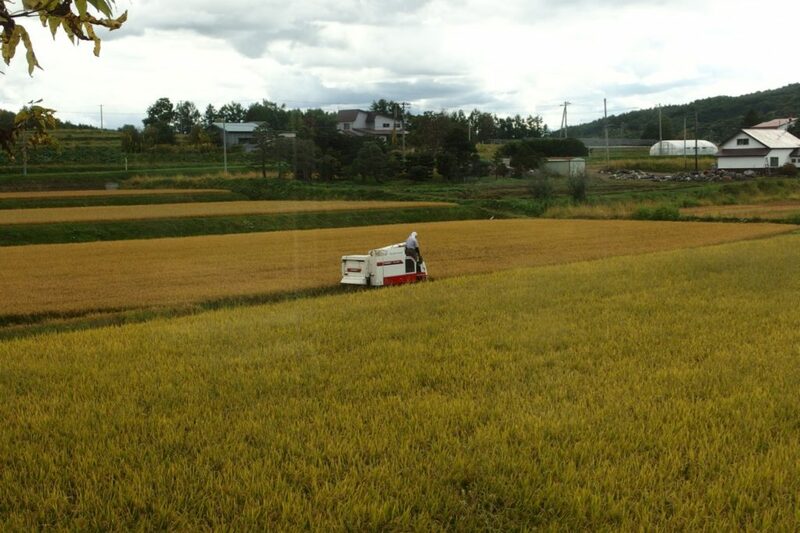 I don’t want to use agrochemicals ( herbicide ), so every evening I am walking in my rice field and remove the weeds.